If you didn’t have a card, Striker had a custom card for you! We’ve lost an all-star autographer. 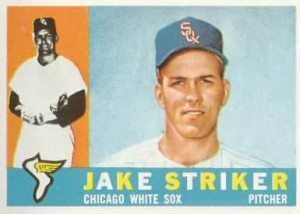 Jake Striker may have been a mere 1-0 in his brief career in the majors. Most importantly, hobbyists who wrote to him were undefeated. Striker always had something special to offer anyone wanting a signature. Check out what Striker offered me in 2010. The Jake Strikers of baseball history remind me why I do what I do! How did he end up on a White Sox card?